That was the forecast today here in Ontario. I managed to get out for a drive today with Janean and we visited our friend Grant. 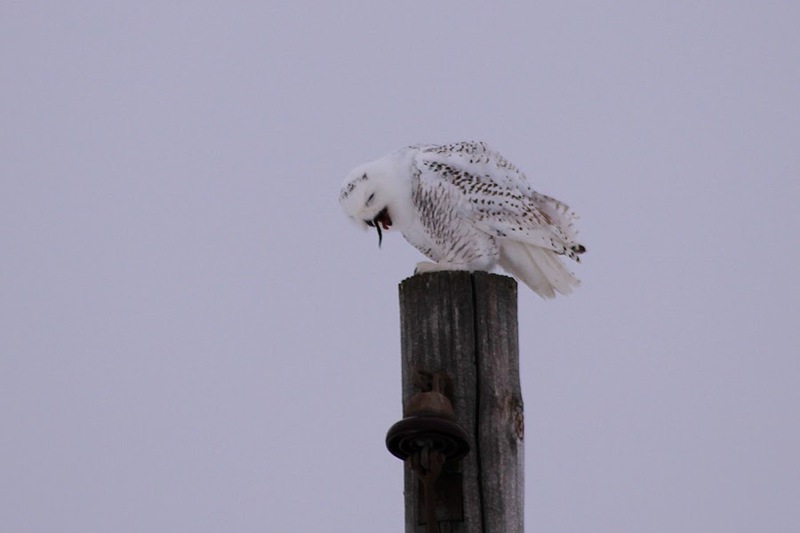 We advised him that a Snowy Owl had been seen within a few minutes drive from his place, so the three of us piled back in the car and slowly worked our way back to the King's Highway via Scugog Line 2. Along the way, we encountered a few Red-tailed Hawks, a small flock of American Robins, a Mourning Dove, and a Downy Woodpecker. Not bad for an area Janean and I should be counting in a little over a week for the Uxbridge CBC. When we got onto the highway, I pulled off to the side on a stretch between Scugog Line 3 and 4 because that is where I understood the bird had been sighted most recently. In retrospect, I believe it might actually be seen more regularly north of Scugog Line 4. At any rate, we scanned the fields on both sides of the road and tried to find a white blob with black vermiculations on white snow drifts. Sounds easy, right? After scanning for a few minutes, we decided to drive past the buildings on either side of the road and tried again. Again, all white fields and no white bird. We turned off onto Scugog Line 4 heading west and repeated the drill. This was proving to be a difficult task, so I drove ahead and found a driveway to turn around in and headed back towards the highway. 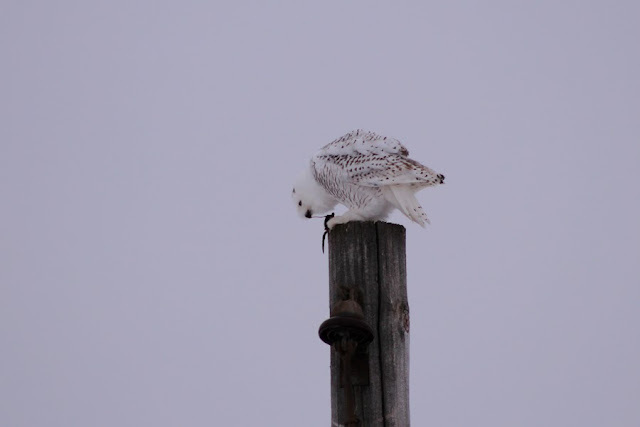 Around 50 metres before the highway, I happened to notice there was a large white bird on a hydro pole. Bingo! We carefully pulled off to the side of road, turned off the engine, and I got my camera ready. We noticed it had prey in its talons and this was a good sign. 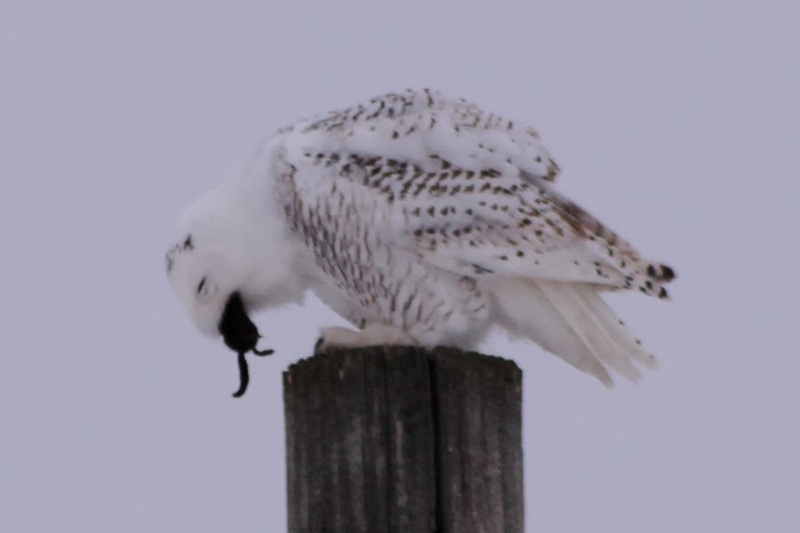 Sometimes when Snowy Owls get forced south due to a crash in the lemming population, they end up in areas that are not very hospitable and seemingly lack food resources to sustain them. I was hoping this wasn't the case with this particular individual because it could well be the highlight bird for Janean and I if we can locate it during the Uxbridge CBC on December 27th. I think one of the coolest things about this scene was how well the sky matched the Snowy Owl! We enjoyed watching the Snowy Owl for over 15 minutes and the fact that we were able to watch it devour its prey made it an amazing experience. 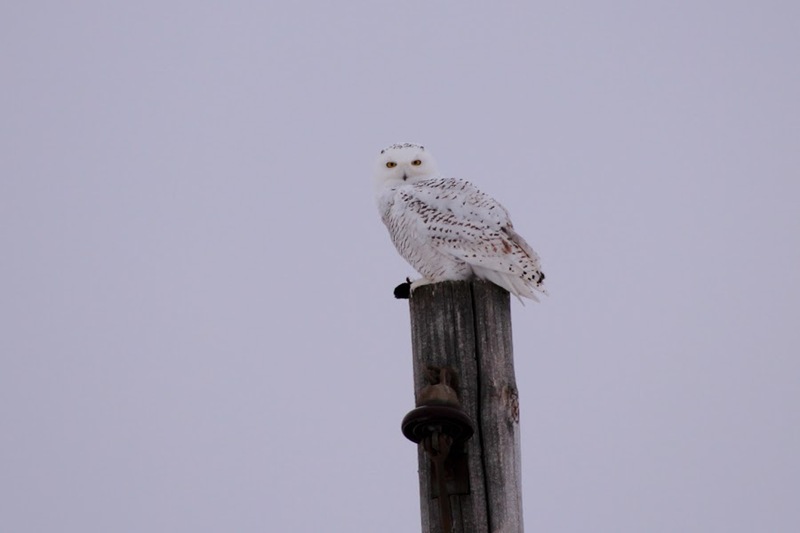 I wish my first Snowy Owl encounter - this was a lifer for Janean and Grant - was even half as exciting as this sighting! I've been purposely ambiguous about what the Snowy Owl had predated. This deserves its own little extra note! I suspected the Snowy Owl had a vole while I was watching it, but I was taking photos and let Janean use my binoculars. Grant and Janean were watching the whole act of the Snowy devouring a small mammal through binoculars and it was suspected that it was a mole. When a couple of my photos are zoomed in, you can see features that seem to confirm it was indeed a Star-nosed Mole (Condylura cristata)! I'm only a few days in to this trip out east, but it will be pretty darn hard to top this sighting! The thick, long tail seems to point to Star-nosed Mole... I would like to see one alive some day!